The traditional Dubrovnik Carnival, organised by the City of Dubrovnik and the Dubrovnik Tourist Board, is celebrating its jubilee, twentieth birthday! This year's Dubrovnik Carnival program has the longest program up until now, is richest in content, and will be held from February 22nd to March 5th 2019. The rich and varied program of the Dubrovnik Carnival includes many entertainment programs for children and adults, from performances by animators and jugglers, to face painting on Stradun for children from nursery schools and primary schools, as well as face painting for small children and costumed families in the City Cafe. There is something for everyone between the Costume Party for youth at the Orlando Youth Club, the Children's Costume Party in Mokošica, and the big dance party for little carnival goers held by the Naša Djeca Association at Hotel Rixos Libertas. 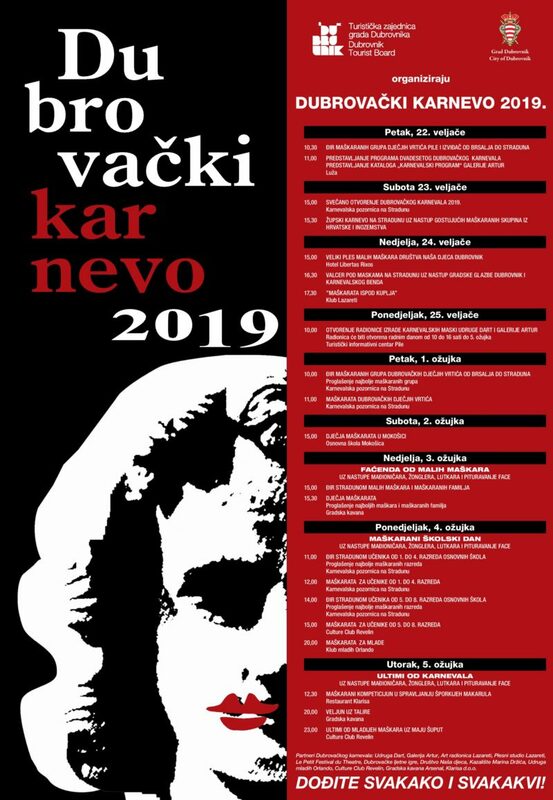 For the first time, this year's Dubrovnik Carnival will host the Župa Carnival on Stradun, with guest carnival groups from Croatia and abroad. There will also be workshops on costume making organised by the Dart Association and Artur Gallery that will be held every working day beginning on the 25th February, from 10 am to 4 pm in Tourist Information Centre (TIC) at Pile. The "In the Attic" Costume Party in the Lazaretto is always great fun, and this year there will be a real treat with the Costumed Waltz on Stradun, featuring performances by the Dubrovnik Brass Band and the Carnival Band. A novelty of the jubilee, twentieth Dubrovnik Carnival is a costumed competition in making the traditional carnival dish sporchi macaroni, which will be held at the Klarisa Restaurant. The culmination and final event of the Dubrovnik Carnival is the traditional Veljun event accompanied by the Taliri band which will be held in the City Cafe on Tuesday, March 5th at 8:00 pm and the festivities continue that same night with the Ultimi finale for carnival goers with the popular Croatia pop singer Maju Šuput that begins at 11 pm in the Revelin club, with free entry for everyone wearing a costume. The City of Dubrovnik and the Dubrovnik Tourist Board have secured valuable awards for the best and most creative costumes of the Dubrovnik Carnival, including two return flights to Istanbul with Turkish Airlines, two return flights to Zagreb with Croatia Airlines along with a weekend stay in Hotel Dubrovnik in Zagreb, and weekend stays for two at Hotel Lafodia on the island of Lopud, Hotel Odysseus on the island of Mljet, and many other interesting individual and group prizes. The tradition of masquerade in Dubrovnik reaches far into the past, and Dubrovnik nurtures these traditions and customs through the events of the Carnival Dubrovnik. Put on a costume, have fun, have fun and win valuable prizes!